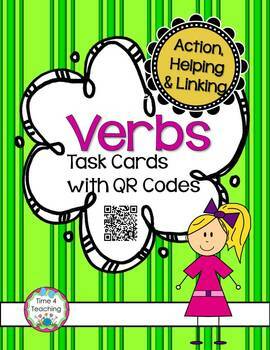 This Verbs Task Cards activity contains 4 sets of task cards with QR codes for checking answers. These 72 task cards will provide your students with practice finding action verbs, linking verbs, and helping verbs. The fourth set of task cards uses the same word in two different ways – as a verb and as a noun or adjective. Students must choose the sentence in which the word is used as a verb. As students work through the task cards, they can scan the QR code to check their answers. However, if you don’t have access to a QR code-reading device, answer keys are provided. Use these task cards as center activities, with early finishers or with students who need remediation or extension activities. They can also be used to play Scoot! 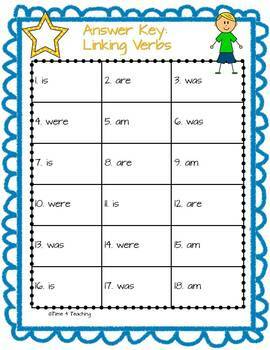 Please download the free preview for a closer look at these Verbs Task Cards with QR Codes from Time 4 Teaching. --Nouns Task Cards with QR Codes. 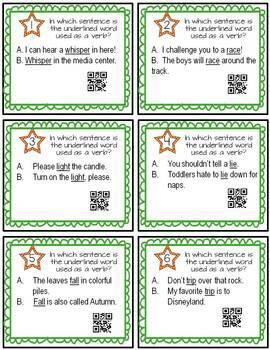 --Money-saving bundle: Nouns and Verbs Task Cards with QR Codes. Stay up-to-date about my store!